Book Your Holiday Party With Us & Get Exclusive Extras and Savings! From intimate gatherings in our private dining rooms to extravagant buyouts in our iconic landmark locations, make your holiday party unforgettable with the award-winning Patina Restaurant Group. As the exclusive caterer at Brooklyn Botanic Garden, Patina Events presents beautifully inspired gatherings in the Garden’s exquisite Palm House and Atrium. Perfect for everything from corporate cocktail parties to extravagant launch events, the Garden offers market-driven, seasonal menus that perfectly accent its surrounding natural beauty. Complimentary Tray Passed Champagne upon Guest Arrival. Cucina & Co offers Mediterranean-inspired cuisine that is perfect for any event or guest. Rustic floors and exposed wood rafters create a warm, welcoming ambiance that complements its widely appealing menu. La Fonda del Sol offers an unparalleled stage for a tapas-inspired, Spanish culinary experience. The space allows for three unique event settings: an intimate private dining room, spacious and elegant main dining room and a colorful, dynamic tapas bar & lounge. Let Naples 45 fill your event with the flavors and aromas of Italy. Authentic Neopolitan-style pizza is the house specialty, along with fresh, luscious pastas and seafood. With its vibrant décor and pizza ovens named for Italy’s 3 major volcanos (Vesuvius, Stromboli & Etna) your event is guaranteed to be irresistibly fun. Vanderbilt Suites is ideal for corporate meetings and events of all sizes. Menus can be custom created from one or all of our MetLife restaurants, and a full array of audio visual equipment is available -- all complemented by its beautiful décor and art collection that pays tribute to Commodore Cornelius Vanderbilt himself. Brasserie 8 1/2 offers innovative French cuisine, wrapped in a world-class art collection and elegant atmosphere. Known for its dramatic red staircase, Brasserie 8 1/2 is a sleek destination that is ideal for creating extraordinary events, just steps from Fifth Avenue. Complimentary bar upgrade with the purchase of a full priced beverage package. Rock Center Café is a dazzling and legendary venue; neighboring The Rink at Rockefeller Center, our spectacular view of the gilded statue of Prometheus and Christmas tree will create an unforgettable backdrop for your holiday event. Complimentary VIP Skate Tickets for The Rink at Rockefeller Center during January – February 2019 with a full venue buyout. 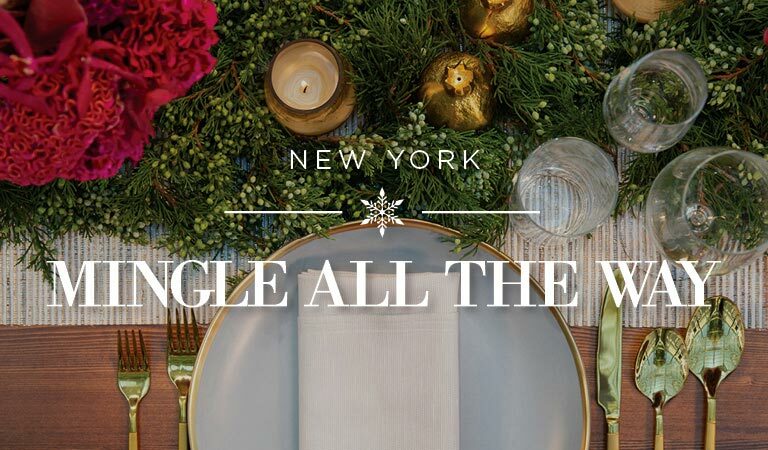 The Sea Grill will capture the essence and glamour of New York for your holiday event. Located on the same level as The Rink at Rockefeller Center, our wintertime views of The Rink and The Rockefeller cannot found anywhere else. Complimentary lighting upgrade valued at $2,000 with full venue buyout. Just next to Madison Square Garden, Nick & Stef’s goes far beyond the usual steakhouse standards. This contemporary restaurant offers great steak, the freshest seafood available and inventive signature sides, all in a stylish atmosphere ideal for any occasion. Complimentary 30 minutes of passed canapes or complimentary bar upgrade. Rowland’s serves stylish American Gastropub cuisine on the One Below level at Macy’s Herald Square. Inspired by RH Macy himself, Rowland’s is the perfect gathering spot for your group when visiting New York’s most famous store. Complimentary Champagne Toast upon guest arrival. Stella 34 serves fresh house-made pastas, traditional Neopolitan-style pizza from our wood-burning ovens and a fresh take on classic Italian cuisine. Located on the 6th floor of Macy’s, Stella offers incredible views of Herald Square and the Empire State Building, with a sleek design that perfect complements its cuisine. Complimentary Champagne Toast or Complimentary Family Style Pizza upon guest arrival. Located in the iconic Empire State Building, State offers classic American food that showcases New York State farmers, winemakers and purveyors. Its sleek, art deco-inspired interior includes an elegant main dining room and state-of-the-art private dining rooms. Complimentary hot chocolate and winter wonderland dessert station. Lincoln Ristorante offers beautiful, contemporary Italian cuisine prepared with authentic Italian methods and spirit. Its glamorous, glass-enclosed dining rooms provide a panoramic view of Lincoln Center’s reflecting pool and Henry Moore sculpture, set alongside a seasonal outdoor terrazza and intimate private dining room downstairs, perfect for meetings or galas of all sizes. Receive a $100 gift card for every $2,500 spent toward food and beverage. Set within the spectacular Metropolitan Opera House, The Grand Tier Restaurant and Revlon Bar offer stunning settings for extraordinary events. With balconies overlooking the Lincoln Center plaza and fountain, The Grand Tier offers fresh, American cuisine, perfect for everything from intimate cocktail receptions to extravagant galas. GRAND CENTRAL AREA RESTAURANTS: Cannot be redeemed for events already under contract. Not to be combined with any other offer or promotion. Must be booked by November 30, 2018 for holiday events through December 30, 2018. BRASSIERE 8.5: Cannot be redeemed for events already under contract. Not to be combined with any other offer or promotion. Must be booked by November 30, 2018 for holiday events through December 30, 2018. ROCK CENTER CAFE & SEA GRILL: Cannot be redeemed for events already under contract. Not to be combined with any other offer or promotion. Must be booked by November 30, 2018 for holiday events through December 30, 2018. ROWLAND’s BAR & GRILL & STELLA 34 TRATTORIA: Cannot be redeemed for events already under contract. Not to be combined with any other offer or promotion. Must be booked by November 30, 2018 for holiday events through December 30, 2018. NICK & STEF’S: Cannot be redeemed for events already under contract. Not to be combined with any other offer or promotion. Must be booked by November 30, 2018 for holiday events through December 30, 2018. STATE GRILL AND BAR: Cannot be redeemed for events already under contract. Not to be combined with any other offer or promotion. Must be booked by November 30, 2018 for holiday events through December 30, 2018. LINCOLN CENTER RISTORANTE & GRAND TIER RESTAURANT: Delivered upon conclusion of event, a gift card for person planning event. Cannot be redeemed for events already under contract. Not to be combined with any other offer or promotion. Must be booked by November 30, 2018 for holiday events through December 30, 2018. BROOKLYN BOTANIC GARDEN: Cannot be redeemed for events already under contract. Not to be combined with any other offer.